BOGOTA, Colombia -- A Boeing 737 jetliner with 131 passengers aboard crashed as it prepared to land and broke into three pieces at a Colombian island in the Caribbean early Monday. The region's governor said it was a miracle that only one person died. San Andres Gov. Pedro Gallardo said 125 passengers and six crew members had been aboard, but the only person killed was Amar Fernandez de Barreto, 68. "It was a miracle and we have to give thanks to God," that only one person died, said Gov. Pedro Gallardo. The state government said in an e-mail that passengers aboard the Aires plane that left Bogota about midnight included eight U.S. citizens and four Brazilians. They were not identified. Passengers said the pilot had announced an impending landing and all seemed normal as the plane descended through rain. But suddenly it hit short and then slid onto the runway on its belly as the fuselage fractured. 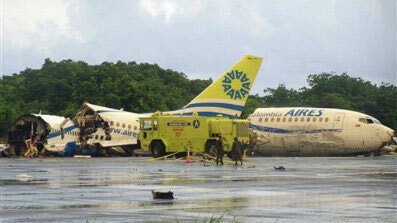 It wound up on one end of the runway, crumpled and in pieces, as passengers scrambled or were helped to safety. Firefighters quickly doused the beginnings of a fire on a wing, said police Gen. Orlando Paez. Ninety-nine passengers were taken to the Amor de Patria Hospital on San Andres, said the hospital director, Dr. Robert Sanchez. He said only four suffered major injuries. "It's incredible. For the dimension (of the accident), there should be more," he said. Sanchez said an initial examination indicated that Fernandez de Barreto may have died of a heart attack. Barrero, commander of the Caribbean Air Group, said by telephone from San Andres that "the skill of the pilot kept the plane from colliding with the airport." He said the cause of the accident was uncertain. "You can't speculate. Lightning? A gust of wind? The investigation will say." Barrero said part of the 7,800-foot (2,380-meter) runway had been closed because parts of the plane were still scattered across it. But enough was usable that air ambulances would be able to land. Paez said by telephone that a group of police officers who had been waiting at the airport for the plane to take them back to the Colombian mainland aided in rescuing the victims.